The Res Gestae Divi Augusti (Latin: “Deeds of the divine Augustus”) is a funerary inscription detailing the life and achievements of the first Roman Emperor, Augustus. The original inscription, which has not survived, was engraved upon a pair of bronze pillars which were placed in front of Augustus' mausoleum. 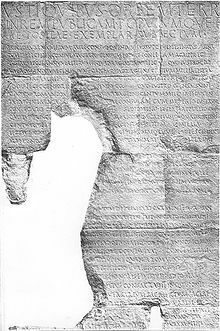 Various copies of the text were found throughout the Roman Empire, the most notable being a nearly full copy, written in both Greek and Latin, found preserved on a temple dedicated to Augustus in Ankara, Turkey. Most historians have concluded that Augustus wrote several versions during his life and kept updating them until the final version which is usually dated to the same year as Augustus' death in 14 AD. As a source, the Res Gestae is not fully accurate. Whilst not lying, he doesn't mention some things that he did like the proscriptions of his enemies. He refers to his rival Marc Antony as 'a faction'. The inscription says much about the money he spent on the people, Rome and the empire. It also says frequently that he has "restored the republic" and only gains his titles because of the universal support from the people and, most importantly, the Senate. This page was last changed on 1 June 2018, at 14:56.